This is the last week of school for Kidlet before Winter break starts. He is getting very excited! 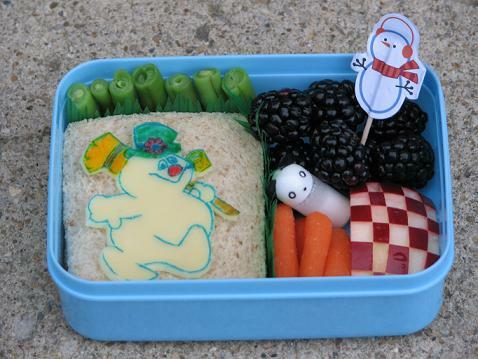 So this week will be all about the holiday bento! Kidlet has Frosty the Snowman made of cheese and food coloring markers on top of a soy ham sandwich with green beans, carrots, checkered apple, blackberries, and a little panda of sugar for the berries. HAHAHA That's an awesome Frosty!